While trying to decide what to write about in this space generously offered by Holly Mullen, my cycling buddy called to say he had been hit by a car while riding his bike. The accident was the motorist’s fault, but that is of little compensation when you are lying amid the twisted wreckage of what used to be a bike. So while our plans to ride the Logan, Utah, to Jackson, Wyo., bike race (LOTOJA) together as a relay were dropped, the topic for this piece came to me like a broken wrist. Anyone who bikes in Salt Lake City and surrounding communities knows that it can be a dangerous and intimidating place mainly because of increasing cars and cyclists on rough and inadequate roads. Candidates running for Salt Lake City mayor tout cycling as a means of alleviating traffic congestion, creating greener and cleaner cities and improving the health of the citizens. My employer, the University of Utah, pleads with students and staff to leave their cars at home and commute by foot, bike or Utah Transit Authority. I agree and try to comply. But if the goal of such entities is to convince a significant percentage of the population to park their car and embrace the bike, changes must be made to improve cyclist safety. Most bicycle accidents involving adults are due to car/cyclist collisions and are a direct result of inadequate road construction. If there is little to no shoulder on a road, a cyclist is obligated to ride within the traffic lane. Why not build wider shoulders during road construction/reconstruction? Similarly if the side of the road is littered with debris. 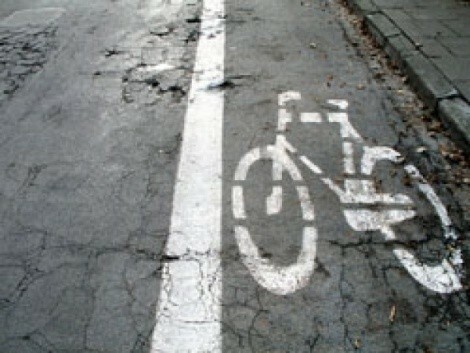 the cyclist must move left to avoid the mess. Cars, approaching from behind, won’t usually see the road debris, and thus may be surprised when the cyclist veers left without warning. How about budgeting more money for street sweeping? While traffic lights work fine in regulating automobile traffic, some of the new lights that require the mass of a car to trigger a signal change are a hazard to a cyclist. I’ve been stuck at such interchanges, waiting in vain for the light to change. Given the two obvious choices, waiting for a car to come up from behind to set the light off or simply running the light when the intersection is clear, I opt for the latter even though it is probably not the safest choice. We need traffic lights that respond to a lighter touch or that have set, timed rotations so cyclists are not forced to run the light. Bike lanes created in wide roadways are very good for delineating car from bike traffic, however, such open lanes seem to be an irresistible site for vehicles to park, even though they are not allowed to do so. Wasatch Boulevard is a cyclist “freeway” that has benefited from new striping that clearly demarcates bike lanes. Yet UTA parks its buses in multiple locations on the street in the middle of the bike lane, forcing cyclists to weave in and out of rush-hour traffic, thus negating the safety of the bike lane. How about enforcing the laws? What I don’t understand, though, is the hostility that has been generated between cyclists and motorists. I don’t understand why motorists ridicule cyclists for what they wear (is it envy they wouldn’t look as good in lycra? ); why confrontations quickly erupt into harsh language, obscene gestures and attacks; and why cyclists sometimes encourage motorists’ wrath by behavior such as riding in three- to five-wide packs. I try not to ride with people who are quick to flip off motorists: I don’t want to be maimed by association. The problem with motorist/cyclist conflicts, of course, is that the consequences can be devastating. I used to be a typical cyclist, avoiding cars and enjoying the ride until I was jerked into the world of bicycle-safety advocacy by the death of a graduate student in our molecular biology Ph.D. program. Josie Johnson was killed four years ago on a ride up Big Cottonwood Canyon. A number of us joined together to put on the Josie Johnson Memorial Bike Ride, the fourth edition of which will be held Sept. 29 at 10:30 a.m. at SugarHouse Park. We use this ride as a memorial to Josie and to all Utah cyclists hurt or killed. Last year, eight Utah cyclists were killed on their bikes, while this year we have suffered three fatalities. We also use the ride to encourage local and state politicians to alter laws to better protect cyclists. Three years ago, we successfully lobbied the “3-foot bill” (3-foot minimum between that car mirror and my shoulder) and are currently preparing for a 2008 foray back into state politics to focus on road safety for cyclists and pedestrians. If the city and state are serious about increasing bicycle use, then we need collaboration and cooperation between government officials to make our roads safe for both motorist and cyclist. Note: Editor Holly Mullen is on vacation. Her column will return Sept. 27. John Weis, a U of U School of Medicine professor, is a fan of and participant in human-powered modes of recreation.